Lots of I/O Units? Wanna en/disable them all at once? Much easier than disabling (or re-enabling) every I/O unit individually. Unhidden by default would be good. My brain can’t remember all these shortcuts anymore and this isn’t something I do on a regular basis so I won’t remember what to do. Should there be an enable as well? It’s a toggle. 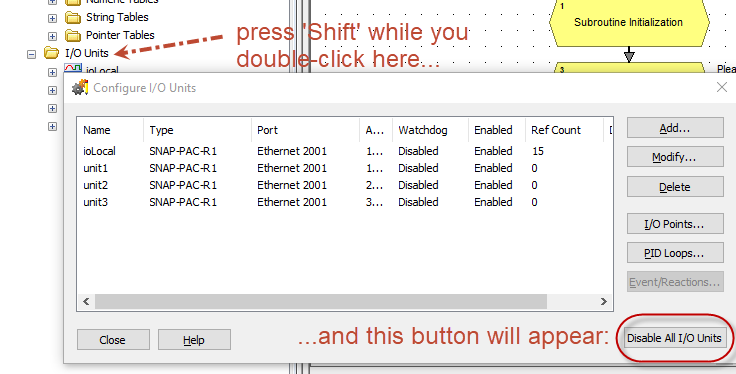 So when you click “Disable All I/O Units” the button changes to “Enable All I/O Units” opto-magically! @philip: on your “can’t remember all these…” that’s why I’m sharing this, because I couldn’t remember what it was either! And saw no reason for this handy feature to be hidden. So thanks for backing me up on that!